Happy New Year! This year Chinese New Year, the Year of the Dragon, is on Jan. 23, 2012. Unlike the Western calendar, which welcomes the New Year on Jan. 1, The Chinese New Year syncs with the lunar calendar, so their new year is celebrated in January or February, and not on the same day. A pair of fish symbolize a happy marriage. Use the freshest fish available (clear eyes are a good indicator of freshness). Julienne ginger as thinly as you possibly can. Brush inside cavity with sauce, then stuff with aromatics. Brush side cut in diagonal slices with spicy brown or black bean sauce. I used a bamboo steamer and fitted it over a large-lipped sauté pan filled with steaming tea (water works, too). Steam fish, covered, until opaque at bone; do not overcook! As fish steams, stir fry ginger and scallions until limp. Remove ginger & scallions and stir bean sauce and cilantro into hot oil. Remove from heat. Around the world, cultures from Spain to Sweden usher in the New Year by serving traditional food said to bring good luck, prosperity and happiness. I’ve noticed the American South’s tradition of eating peas for pennies and greens, said to symbolize dollar bills, has caught wind in Michigan. I’ll bet in this economy there must have been quite a run on peas and greens a few weeks back. But even though I ate my peas and greens on New Year’s Day, since yesterday, my luck’s run awry; within a 24 hour span my basement flooded due to a clogged sewer line in the street and the power was knocked down in my neighborhood. I need additional ammunition to ensure Lady Luck does a better job watching my back; lucky for me the Chinese have a plethora of food said to bring good fortune when welcoming their lunar new year. According to many websites, including primaltrek.com, the Chinese character for fish has the same pronunciation as the Chinese character for surplus. The fish symbolizes the wish for “more”, more good luck and more fortune. (More insurance, in my case.) A pair of fish represent a happy marriage, so the following recipe accommodates two fish. 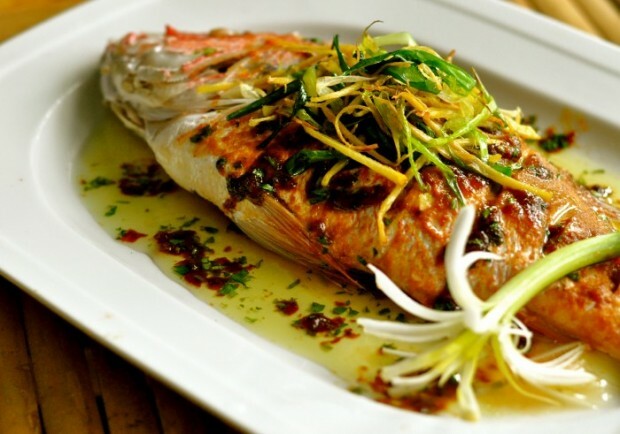 Fish is often served on the eve of the Chinese New Year, and there is much protocol surrounding the custom. If you or your guests are squeamish about eating something that appears to be regarding you, I recommend covering the head with a Dragon Lily Blossom, which blossomed as I brewed the tea I used to steam my snapper. (The tea buds were purchased from Spice Merchants in Kerrytown). The tea imparts minimal flavor, but the orange lily and osmanthus blossoms are an interesting garnish and conversation piece. Monahan’s Seafood in Kerrytown always has a marvelous selection of whole fish, which Mike Monahan tells me are much appreciated by his Chinese clientele, who insist their fish be as fresh from the sea as possible. He selected two beautiful snappers for my recipe below, but says walleye would have been an excellent choice, as well. In the American South, eating leftover beans demonstrates frugality to the good-luck Gods, ensuring them you are sincere and deserving of prosperity. According to Chinese Food Superstitions, it’s protocol, as well, to save leftover fish for later consumption, insuring abundance for the future. The Feng Shui horoscope forecast for 2012 says “… The year 2012 holds much promise and may be a major transition in your life. Whether it turns out extremely good, or really bad, will depend on how you ride the mighty Water Dragon.” A great year for cresting waves with the Water Dragon – as as long as he’s not in your basement. If steaming fish over tea, follow package instructions and brew enough tea to fill the wok or pan under which you will be steaming your fish. Take care to remove blossoms immediately after they open, otherwise they will fall apart. Score one side of fish with diagonal slices at 1-inch intervals, just cutting through the skin. Brush 2 teaspoons of bean sauce into each fish cavity. Stuff cavity with cilantro sprigs and several slices of ginger and scallion. Rub an additional 2 teaspoons each of bean sauce over scored side of fish skin. Meanwhile, place a bamboo steamer insert over a large lipped sauté pan (see above equipment notes). Pour tea or water into saute pan or wok to fill to 3/4-inches and let come to active simmer. When ready to steam fish, wipe off accumulated moisture from steamer top, place fish, scored side up, in the steamer insert over simmering tea or water; cover tightly. Steam fish 15-20 minutes depending on size of fish. Fish is ready when opaque to the bone; do not allow fish to oversteam. While fish is steaming, in a heavy bottomed pan or wok, heat oil to sizzling hot. Stir fry julienned ginger and scallions 30-60 seconds, continuously stirring, or until they are fragrant and limp. Remove ginger and scallions from oil; reserve. Reduce heat to low and whisk additional heaping tablespoon of bean paste and chopped cilantro into oil. Stir 30 seconds, then turn off heat. With a spatula, carefully remove and plate fish. Reheat bean and oil sauce quickly, if cooled, then divide sauce and reserved ginger and scallions over fish. Serve immediately. Equipment: You’ll need a device to steam your fish. I used a 12-inch bamboo steamer purchased from Tsai Grocery on Oak Valley Drive, off Ann Arbor-Saline Road. It was a perfect fit over my 12-inch large-lipped saute pan, which I filled with 8 cups of tea for steaming. Mike Monahan broke the center off of his vegetable steamer, which works well for him. He says anything that accommodates the fish, keeps it above the liquid, and has a tight fitting lid to keep the steam from escaping will do the trick.